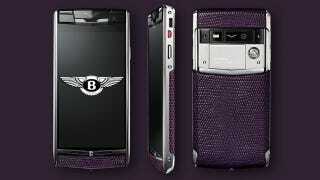 Nothing says Luxury like coating Chinese-made electronics in polished titanium and "damson purple lizard skin". Bentley knows this, so they've tapped Vertu – maker of the world's most expensive slabs of glass – to produce B-branded phones. And they've signed an exclusive deal that has Vertu kicking Ferrari to the curb. The two British brands inked a five-year deal that marries Bentley and Vertu, meaning tracksuit Ferrariphiles will have to pick up a new Conti GT to get the latest five-figure phone. The first "Vertu for Bentley" phone is set to arrive this October, followed by four more designs "which will encompass authentic and iconic Bentley design elements and luxury lifestyle services." Part of those services include a dedicated Bentley app with a concierge, along with Vertu's own Life and Certainty apps (don't ask). The Bentley phone is likely based on Vertu's Signature Touch, with a 4.7-inch display, wireless charging, magical speakers, and a Snapdragon 2.3GHz quad-core processor running the latest version of Android. Considering the vast majority of Bentley owners rock an iPhone, we'll see how that plays, but then again, it's not like dropping $11,000 on a phone is steeped in logic.